A solid effort from Steinberg with some real highlights, including the FlexPhraser and superb synth and filter features. Powerful new synthesis engine. Great filtering. Good interface. Flexible sound set. Clever FlexPhraser function. No auditioning in browser. Not all synthesis styles included. No raw sample import. In its time, Steinberg's Hypersonic 2 was a good workhorse synth/ROMpler plug-in. However, things move on. 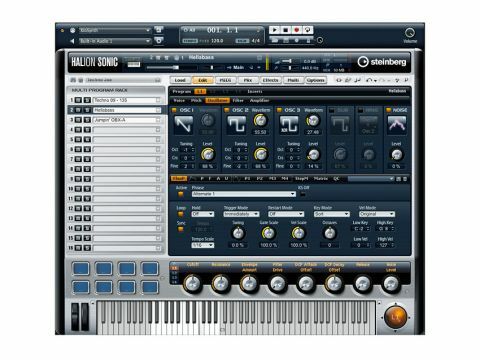 Four years later, we have HALion Sonic, which combines Steinberg's sampling/synthesis engine with sound design from Yamaha's Motif team to deliver over 1200 workstation-style synth, hybrid and acoustic sounds. So is it just a revamped Hypersonic? Not really: visual similarities aside, this is a much deeper instrument. HALion Sonic is built around a framework featuring 16 program slots. You can use this system to control, balance and play up to 16 separate programs on different MIDI channels or, alternatively, stack them up to create complex sounds. "The filters are one of HALion Sonic's most powerful elements: there are a whopping 23 different types." The main area in which HALion Sonic overshadows its predecessor is its underlying sampling/synthesis engine. This uses technology from the forthcoming HALion 4 to deliver four modes - Synth/Sample, Drum, Loop and Instrument - and combined with the four layers per program, there's plenty of scope for sonic manipulation. Additional features include four insert effects per layer and four per program, four global aux effects, LFOs, 24 filter types, envelopes (pitch, amplitude, filter and freely assignable), a 32-slot modulation matrix, a step modulator, eight preassigned quick controls, eight trigger pads and an X/Y controller that's cryptically dubbed The Sphere. Finally, there's the FlexPhraser. This handles everything from basic arpeggiation to performance assistance for guitar, bass and drum parts, using a library of over 1400 phrases. So, HALion Sonic clearly packs some serious horsepower. In use this is most obvious with the virtual analogue system, which offers three oscillators plus sub, noise and ring modulation. In addition to the usual sines, squares, saws and whatnot, HALion Sonic's oscillator types include cross-modulated, synced and the ring modulator-esque 'exclusive or'. Also worth mentioning are the four LFOs, two monophonic and two polyphonic. The latter allow independent modulation per note, and also have additional shape-editing features. The filters are one of HALion Sonic's most powerful elements. There are a whopping 23 filter types, all available in Classic and Tube Drive flavours. You can use them in serial and parallel modes, and morph between up to four filter shapes. The results are superb and you could easily get waylaid by them for some time. Understandably, not all features are available in all modes, with the step modulator and the powerful filter configurations only found in the Synth/Sample mode. In contrast, the Instrument mode is for keyswitching multi-articulation patches, and offers a much simpler single-tab interface. Similarly, the Drum and Loop modes share an interface, which is also less full on. However, it does include a keymap graphic and parameter adjustment for sounds assigned to each key, including effect send levels. HALion Sonic uses a tried and tested sound module concept whereby multiple programs (aka patches and presets) can be combined into 'multis'. However, each program also consists of up to four sound layers, and these can be loaded individually from the browser. The significance here is that each layer can be any one of the four modes: Synth/Sample, Loop, Drum and Instrument. The upshot is that you can combine totally different sound and synthesis types not just at multi-level but also at program-level. When you consider that you also have fully independent FlexPhraser options for each of those layers and the program as a whole (so five in total), as well as individual insert effects for each layer and the program and quick controls for each layer and the program, it's obvious that HALion Sonic is a very powerful instrument. In use, the interface makes this all very easy to navigate, although we did wonder what we should be doing with all these options. Our only real gripes are the fact that individual layers can't be grouped by mode type in the browser. This and the fact that you can't audition layers before you load them means a bit too much guesswork is involved when hunting new layers. In use, we found the differences between modes the most confusing aspect of HALion Sonic, mostly because you have no way of knowing before you load a program which modes have been used. It's not unusual to find a program combining synth and sample-based layers, which isn't a problem in itself, of course. But if you're yearning for a keyswitching sampled bass sound, you can't search on that basis. Overall, the sounds themselves are pretty good, featuring plenty of pads, basses and keyboards. A sizeable chunk of the drums category is taken up by loops. Most of these are very good, and the individual control over slices and pattern randomisation allows for some cool variations (although for full pattern editing, you'll have to drag them into your DAW). The drum kits are more limited, however, and the one that's supposed to bring you the thunderous sound of classic Led Zeppelin is particularly underwhelming. On the 'real' instrument front, there's a good array of electric guitars, and we were pretty impressed by the combination of acoustic guitar and FlexPhrases both for picking and strumming. For some programs, you'll also find the trigger pads assigned to play chords using the 'snapshot chord' feature. In contrast, the orchestral strings failed to convince us. As mentioned, effects are available both as inserts and auxiliaries, and of the 17, the REVerence convolution reverb is the highlight. The remainder do the job perfectly well, although the amp sim is lacklustre. As ever with workstations, the broad sound palette means that HALion Sonic has both good points and bad points. If you're after a dance or acoustic-specific instrument, there are better places to look. However, its underlying sound engine is very good, and although the workstation doesn't cover all synthesis bases and there's no raw sample importing, what's included is enormously flexible. Beyond this, HALion Sonic's most unique aspect has to be the FlexPhraser, which does an excellent job of blurring the boundaries between arpeggiator and auto-accompaniment. If you're sure a workstation is what you're after, this ticks a lot of the right boxes. Acoustic Guitar - using the auto strum and picked acoustic programs. The chords are assigned to the trigger pads using the snapshot chords option and the pattern is from the FlexPhraser library. The picked guitar uses 3 expression articulations - muted, open and harmonics. Chill out - using a multi combining string machine, warm grand piano, kalimba, flute, kick drum and tenor sax we've programmed a typical chill out performance. Both flute and tenor sax are not articulation patches but do have reasonable velocity sensitivity and this is obvious in the sax solo.